Do you have a bunion? A bunion–from the Latin “bunio,” means enlargement. A bunion is an enlargement of the joint at the base of the big toe. This forces the toe to bend toward the little toes. 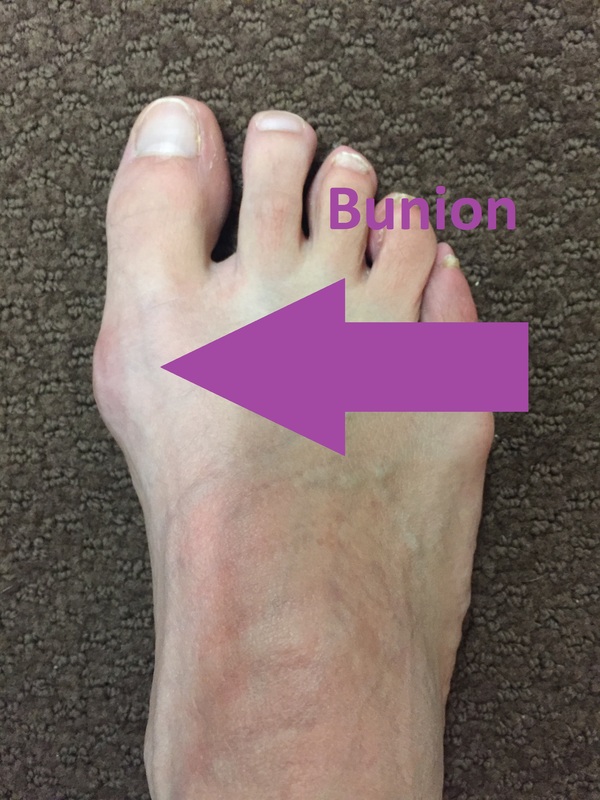 Since this joint carries a lot of the body’s weight while walking, bunions can cause extreme pain if left untreated. The big toe joint itself may become stiff and sore, making even the wearing of shoes difficult or impossible. Bunions affect people of all ages. Many different reasons for a bunion include genetics, ligamentous laxity, shoe gear, flat feet, your foot mechanics (the way you walk), one leg longer than the other and many more. There are both surgical and conservative treatments for bunions. Conservative treatments include a change in shoes, padding of the painful area, cortisone injections and custom orthotics. Your doctor will be able to tell you which of these may be helpful to you. The success rate for surgery is nearing 100%, with a very, very small chance of reoccurrence. 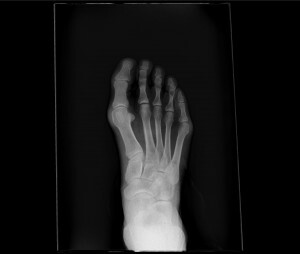 An xray is important for your doctor to determine what bunion surgery is correct for you. The main measurement is the angle between in long bones in your foot. Depending on the bunion you have you may be able to walk the same day of surgery in a boot or surgical shoe. Sometimes a period of not walking on the foot after surgery is needed. Your doctor will be able to tell you exactly what surgery is right for you! Be there when you need them. Podiatrists treat conditions of both the foot and ankle. If you have pain or questions about your feet, they are well qualified. Each podiatrist goes to a medical school specifically for foot and ankle. Today’s podiatrist also does a three year surgical residency. If you have consistent pain or problems, you don’t have to just live with them. Come see us and we can answer questions and give surgical and non surgical treatment options for anything from discolored or ingrown nails to bunions and fractures. Treat your whole family. Our podiatrists are well qualified to treat feet and ankles from birth. 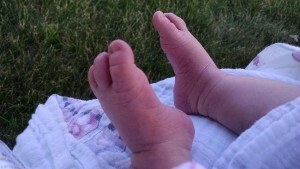 If you have questions about flat feet or otherwise bring your child so they can be answered. Some things may be normal, while others can be treated easily so that they may have decreased pain and less problems later on in life. No question is silly when it comes to children. Similarly the elderly are treated for calluses/corns, bunions hammertoes and more! Difficulty with balance is evaluated and many times can be addressed at the level of the foot and ankle. Of course active people also have foot issues at times as well. All can be treated in the same spot! Keep you on the road to success. Once your pain or problems are improved with treatment, a plan is made to reduce the risk of your problem coming back. Your podiatrist will educate you and give you the tools to know how to recognize the problem sooner in the future. Little to no pain is great, but if a few simple things can keep it away, we will let you know. Prevent major issues in the future. If you are diabetic, speaking with your podiatrist can open your eyes and make you look more at your feet. Diabetes can affect many body systems including blood flow, nerves, kidneys, healing time and eyes. Decreased sensation and decreased healing time can be a very bad combination causing ulcerations and sadly, amputation. An appointment to evaluate your risk and give you the tools to prevent future issues is very important. Make your back, hips, knees and feet feel better. Much of the way we feel and walk depends on our feet. If our feet are not supported correctly it can put strain on the joints of the foot, ankle, knees, hips and back. The podiatrist can evaluate your walk and look at the bones of your foot with an xray to determine what type of support you need. Support can come in a variety of different ways including over the counter inserts, different types of shoes, braces and custom made orthotics. 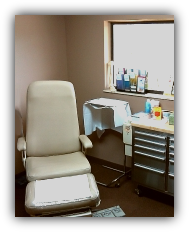 The doctors will find a plan that you like, are comfortable with wearing and provide maximum relief. Dr. James Hirt and Dr. Erin Holdren Otis are podiatrists at Fenton Foot Care and Brighton Family Foot Care. They are ready to help you with your footcare needs. What your runnning shoes are not giving you. I have spoken with many runners and their trials of trying to find the correct running shoe for their build, running gait, mileage, terrain and foot type. There are many, many types of shoes to choose from and the task can be daunting. Let me start with what a running shoe can offer for you. The first is protection from the road below your feet. Why wear shoes in the first place? The reason is to allow you to run on anything from icy paths, rocky dirt roads, a smooth river trail or a grassy field. The second a running shoe will offer is cushioning to take away a little shock from your body falling to the ground with every step at six times your body weight. 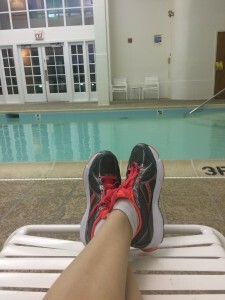 Some shoes like the Hoka brand have a very thick sole and offer what many of my running friends call a “smooth ride.” Other shoes are for more efficient “ball of the foot” runners like the Nike Free, offer less between you and the miles ahead. Ok now let’s discuss what a running shoe is not going to give you. Arch support. That insert in your shoe is usually colorful and soft, but little else. 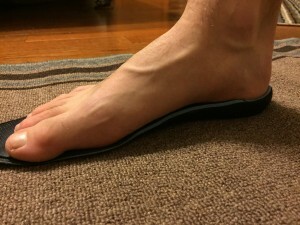 It is flexible and may have a little more material where the arch of your foot is but it is not support. If I can bend the insert with my hands then you can definitely do it with your body weight. 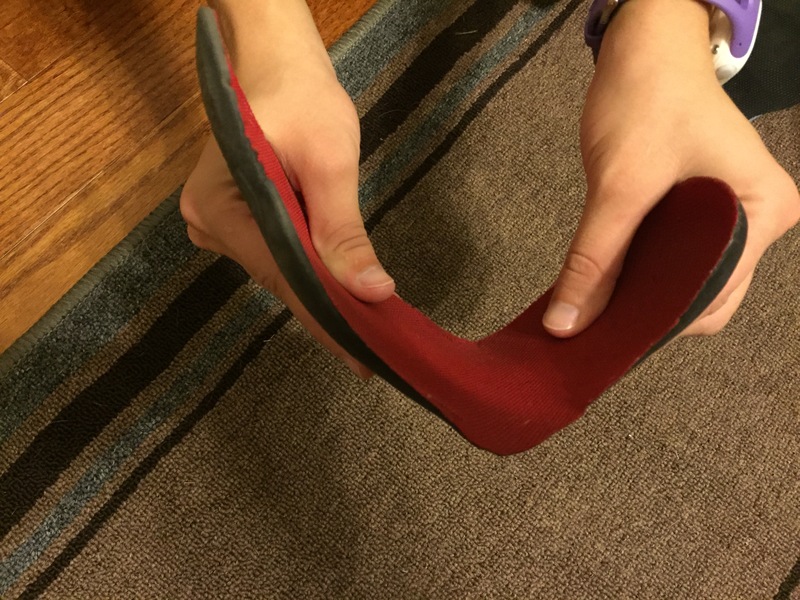 I have heard from many runners “I bought these shoes because they have good arch support.” The shoes you have purchased may have stability, they don’t bend in the midfoot, which is a good quality of a shoe but they don’t support your arch. Any shoe that offers memory foam may feel good and squishy but it is not arch support either. Note the flexibility of the standard shoe insert. 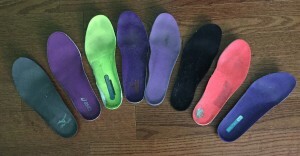 Inserts pulled out of running shoes. Shoe inserts all look about the same. These are from Asics, Addidas, Fila, Sketchers, Nike, Saucony, Mizuno and New Balance. I have run in about every major shoe brand. A normal arch height foot on a standard shoe insert. 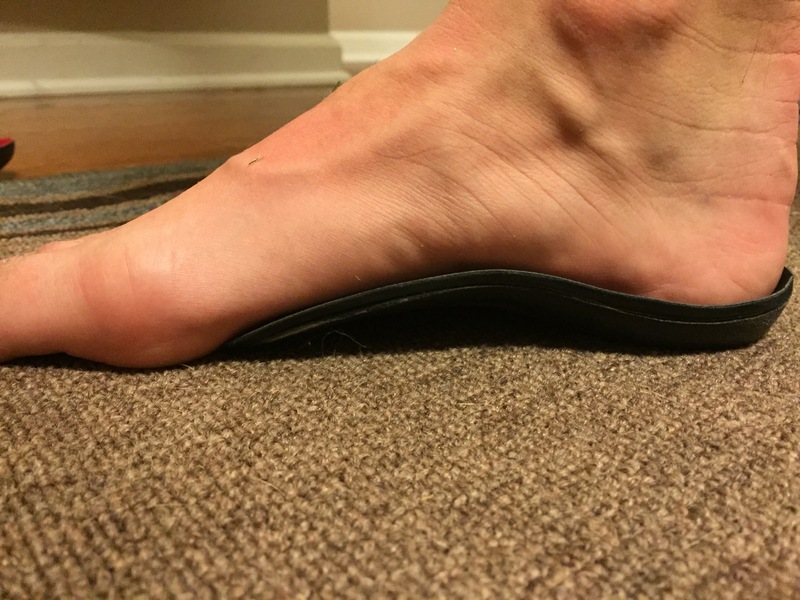 The same normal arch height foot on a custom molded semi rigid orthotic that fits the arch and heel very well. Not absolutely everyone needs arch support but if you have had foot pain, plantar fasciitis, heel pain, arch pain, very high or low arched feet, a custom molded orthotic made to your exact arch is an excellent way to support your arch and foot. If you have tried orthotics in the past but they were too rigid or painful for you there is an answer for that too. An orthotics doesn’t need to be made out of a hard material to be effective. A semi rigid device can be made so the main structure has a little give to it and it is covered with a soft material to make it comfortable to wear. With anything made specific for you and your foot, Dr. Hirt and I want to make sure that you love wearing it. Given time you will not even notice that you are wearing your orthotics, but will become aware if you forget to put them in a pair of shoes. Both Dr. Hirt and I wear orthotics in all of our shoes. 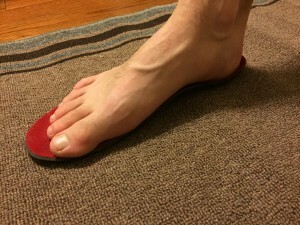 A high arched foot on a standard shoe insert. A high arched foot type in an over the counter semi rigid insert. A high arched foot type in an excellent fitting rigid custom molded orthotic device. An orthotic can turn an okay pair of shoes into a great pair and searching for just the right pair of shoes may become a little bit easier. If arch support is what you are looking for, look no further than Fenton Foot Care and Brighton Family Foot Care or your local podiatrist. Do you have dry, itchy or scaly feet? Dry and itchy scaly, feet are common in the fall and winter in the Midwest as we start to use the heat and the air dries out. The treatment of dry feet includes a good skin lotion that is ointment based instead of water based. The effective lotions tend to be thicker. When applied at night and covered with socks it allows the lotion to soak in and moisturize the feet and legs. When normal lotion doesn’t take care of your problem you may have athlete’s foot. Athlete’s foot, also known as tinea pedis, is caused by a common fungus. This infection affects the skin in between the toes and the bottom of the foot. It does not have to itch, but usually does. It is seen in people who wear closed toed shoes during the day and cannot allow their feet to breathe. Athlete’s foot can be caused by walking barefoot in a place someone with foot fungus has already walked. Changing your socks daily or when they get wet, can help prevent athletes foot. Wearing shoes or sandals at the gym, pool and lake is also helpful in the prevention of contracting foot fungus. Sometimes an infection is too much for an over-the-counter medication. At that point you need to come see a professional who is knowledgeable in treating this infection. The fungus that causes athlete’s foot also can affect the toenails. The importance of treating athletes foot properly is so that thick and discolored effects of toenail fungus do not occur. Other things that can cause dryness and scaling include psoriasis and eczema. A skin scraping biopsy sent to a pathology lab can determine what is causing your problem and dictate how to treat it. As school starts and schedules get busy, don’t forget to check your kids feet and hands for warts. Warts, or verruca is the medical term, are caused by a virus. This virus is very common and can be picked up at the pool, the beach, the shower or in the gym. The microscopic virus enters the skin of your hands and feet through tiny breaks in the skin. Dr. Holdren Otis most commonly sees them in children, specifically ones who like to go barefoot, like gymnasts. Warts are not always painful but when they are on a weight-bearing surface they can build up a thick skin layer and feel like walking on a pebble. Warts usually have a white thick covering with pinpoint black dots representing the capillaries that supply blood to the wart itself. Warts can also be seen on the tops of hands and feet as well, but are not as painful. It is important to treat warts when they are first noticed so they do not spread or get larger. A larger wart can be more difficult, more painful and may take more treatments than a smaller one. Plantar (bottom of the foot) warts can be very frustrating to treat and over the counter medications may not be strong enough. If over the counter medication fails for your family’s warts please come see Dr. Hirt and Dr. Holdren Otis at Fenton Footcare. We have the latest treatment for warts. How can you prevent warts? Lysol or other agents that kill viruses are used in the shower and can help it from spreading to other family members. Avoid picking at warts so they do not spread. Sandals and shoes are recommended in public places like the pool, gym and locker room. Keeping your feet clean, dry and changing shoes and socks daily is always helpful. Heel Pain=Plantar fasciitis, Well Not Necessarily. “You almost want to pee in your bed rather than go to the bathroom. It’s really painful in the morning,” Albert Puljos, a baseball player for the Angels, said it best in an interview with USA today in 2013. Plantar fasciitis, also known as heel spur syndrome, is the most common cause of heel pain. It is seen in individuals who are physically active or have increased their daily activity. The plantar fascia itself is a thick band of tissue attaching to the heel bone, the calcaneus. Tugging and pain are usually felt at this attachment, but pain can be in the arch as well. Pain in the morning and when getting up to walk after sitting for a period of time are common complaints. Although plantar fasciitis is the most common cause of the heel pain, there are other more serious things that can cause pain in the same area. These things include a stress fracture of the calcaneus (heel bone), which occurs with increased activity as well. Also tarsal tunnel, very similar to carpal tunnel of the hand and wrist, can cause shooting pain, tingling and numbness to the foot. In children the closing of the growth plate can cause heel pain when running and jumping. Having your heel pain checked out by a doctor is very important to rule out the other diagnoses. In addition, your pain can be treated quickly and efficiently with all that the medical community has to offer. It is abnormal to have heel pain that does not go away. Call Fenton Footcare today to see one of our doctors. Good Luck to All Crim Runners! Stick with what you know! If you are like me, you have trained for four months (or more!) leading up to the Crim. 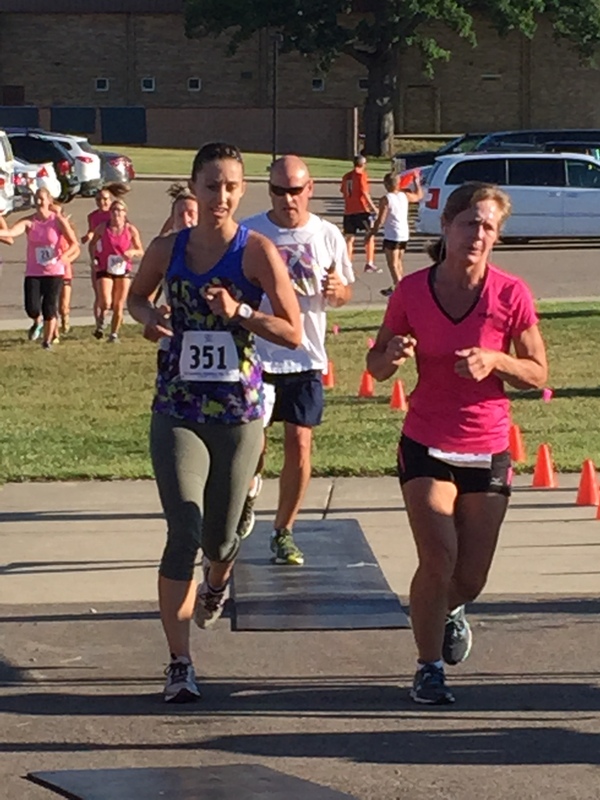 It is quite difficult to be a runner in the greater Flint area and not consider doing the Crim each year. Flint knows the Crim. People from the area who have never run the Crim know that the longest race is 10 miles and not a “marathon.” I always look forward to seeing Flint in such a positive light. 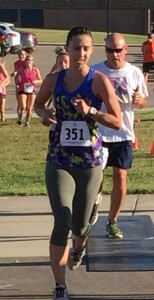 The local bands and cheerleading teams impelling me to run faster always make me smile. 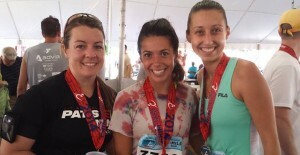 I love seeing the people of Flint waking up to come out of their homes around the course and cheer for all the runners. Training for months prior has allowed you to figure out which shirt, shorts, shoes and socks work best for you on long runs. Don’t deviate from what you know for a race. If you have recently purchased a new pair of shoes but have not gotten a long run in them, leave them at home on race day. 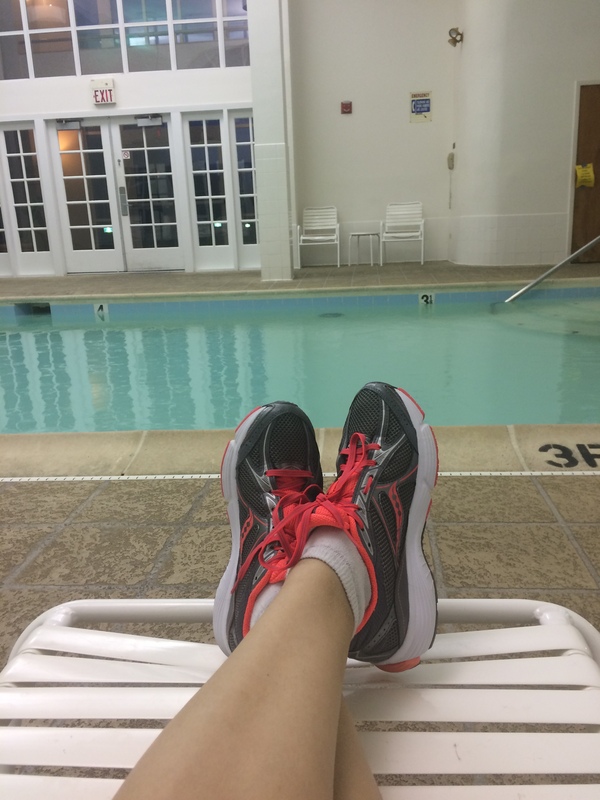 I am a runner, I also get lots of questions from patients about what shoe to buy. Running shoes are the only essential piece of equipment needed for the distance runner. 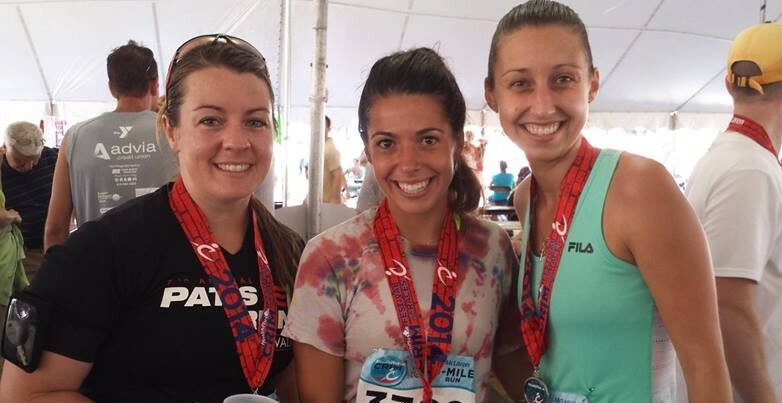 Studies have shown that 35-60% of runners have minor musculoskeletal injuries EACH year. There are multiple reasons for injury including overuse, running surface, poor strength/flexibility, biomechanics and lastly, shoegear. First, here is some background on running shoes. Shoe companies try to help with the decision by categorizing their shoes into Cushioning, Stability, Motion Control, minimalist and “barefoot” types. The idea behind these categories is to reduce injury and give options because feet come in all shapes. Cushioning shoes are designed for runners with a stable foot that needs some shock absorption. Stability shoes are made to have a medium amount of support. Motion control shoes have medial arch fill and lots of cushioning for a more stable ride. Minimalist shoes are made to be lightweight, without arch support and are highly flexible. Barefoot running shoes are made to give a few millimeters between you and the ground to protect your skin. Many research studies have been conducted and it has proven difficult to correlate gait and foot type with the “correct” type of shoe. With 125+ different running shoe companies all doing their own thing-the best way to know is to try a shoe on. *** please note that I stay away from the common terms “pronation” and “over pronation” when describing shoes and running gait. Pronation is an often misused term and a complex motion because it involved three motions in the foot, dorsiflexion, abduction and eversion. Pronation is not a bad thing that needs to be stopped, it is a normal and essential motion of our running and walking gait. Make sure the shoe fits when you first put it on and walk in it. Shoes will rarely stretch out or form to your foot as you wear them. Some shoes stores will even let you run on their treadmill with your new shoe options. The toebox must have enough room for your toes, both width and depth, so blisters, calluses, toenail problems and pain do not slow down your training. The heel should not slip or rub. If you wear orthotics or inserts bring them to the store with you to make sure you have the perfect fit. A study in 2008 showed that running in a pair of shoes for as little as 200 miles can decrease the cushioning and cause adaptations in running gait! The range of running shoe life time has been given between 350-600 miles. I prefer about 350-400 miles. If you notice your ankles, knees or back are a little more achy than usual, consider the age of your shoes. Alternating two pair of good shoes can be helpful as well. If you are an avid walker or an experienced runner, you have probably experienced shin splints. Shin splints are one of the most common lower extremity ailments and are characterized as pain in the front inside area of the shin bone and are caused by overexertion. The most common cause of shin splints is inflammation of the sheath that surrounds the shin bone called the periostum. Other causes include: having flat feet or high arches, inadequate footwear, running on hard surfaces, and increasing your training too quickly. If the pain is really bad, come in and see us as soon as possible. Our doctors can give you a full diagnosis to find out if there is something more serious, such as a stress fracture in the area. If we discover something more serious than shin splints, we can design a treatment plan and get you back on your feet in time to enjoy summer! 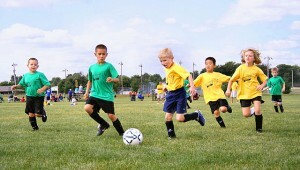 Are Your Kids Wearing the Right Shoe for the Sport They Play? It’s important to choose the right footwear for your children’s activities. Sneakers made for tennis players will provide different support and traction than cleats made for football players. Below is a list that will help you make the best shoe choices for your little athlete, or even for yourself! A thick, stiff sole that gives support while running and landing jumps. Basketball players should look for high ankle construction that supports the ankle during quick changes in direction. Volleyball players should look for a lighter shoe, with less midsole support for quick starts and stops. A good amount of high ankle support is especially important for lineman and other players who make frequent sideways movements during play. Football and lacrosse players should have shoes with proper traction on a grassy field, in both wet and dry conditions. Shoes with proper traction can help prevent injury. Soccer shoes should have a good-quality footbed, which can help provide proper arch support. Make sure they feature the stud type for the ground that will be played on most often: soft, hard, firm, or turf. Also, use molded rubber cleats rather than the screw-on variety. Shoes should offer plenty of arch support. 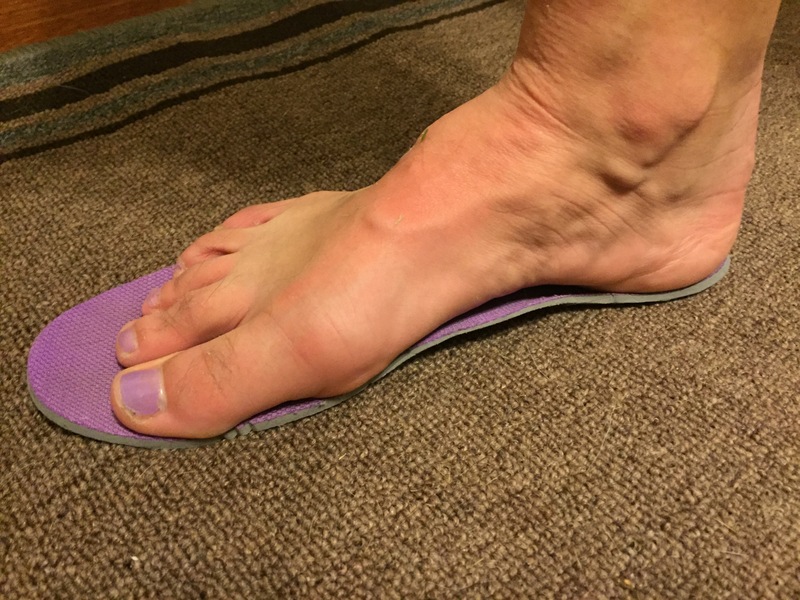 If you experience arch pain, try using customized shoe inserts called orthotics. Baseball and softball shoes should have no more than a half inch of space between the big toe and the end of the shoe. Metal baseball spikes should not be used by athletes younger than 13. A good running shoe should provide maximum shock absorption to help avoid injury. It is also important to match your shoe to your foot’s arch type (high, medium, low). Replace your running shoes after 300-500 miles.